[From IMDB:] About the inhabitants of a small Iowa town suddenly plagued by insanity and then death after a mysterious toxin contaminates their water supply. I feel like I owe this movie an apology. I’ve owned it on DVD for two or three years now, but all I remember about it is the opening scenes and then…falling asleep. Yes, I’d pressed play at something like 3am, when I was super tired, but for some reason I always assumed I’d fallen asleep because the movie sucked. Thankfully, several years later, I can now say that it doesn’t. 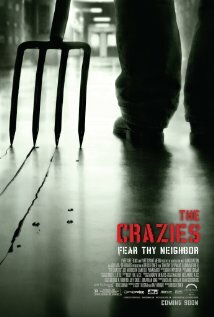 Sure, The Crazies has its issues (as does any movie). Like, it took me a while to realise that I’m prejudiced against Timothy Olpyphant’s slightly-too-wide eyes, which make me read everything he does as overacting. And the movie seems to be inconsistent in terms of how aware people are of their actions when under the influence of whatever virus it is that’s making them crazy, And everything is a bit, well…formulaic. The Crazies can’t be faulted on its offering up of ongoing action, and the building of tension (if you can get past how predictable it is). And it can’t be faulted, in terms of its deliver of some suitably dramatic scenes. Honestly, there’s little I can fault The Crazies for. It’s a suitably action packed pseudo-zombie movie, which hits the appropriate (and therefore expected) emotional notes. and has obviously been produced by a high quality team of filmmakers. There’s an impulse with a movie like The Crazies to suggest that it’s a good ‘middle of the pack’ type of movie, but I don’t actually think that’s true. It is good; surprisingly so, even. It’s just not particularly exciting – but that might just say more about me than it. P.S. No, I haven’t seen the original yet. Yes, I will be aiming to rectify this.